Simple tools were popular here a couple of months ago. Fellow pre-Depression Era modeler Dave Emery shared several ideas so he steps in as a guest blogger with more details. Take it away, Dave! 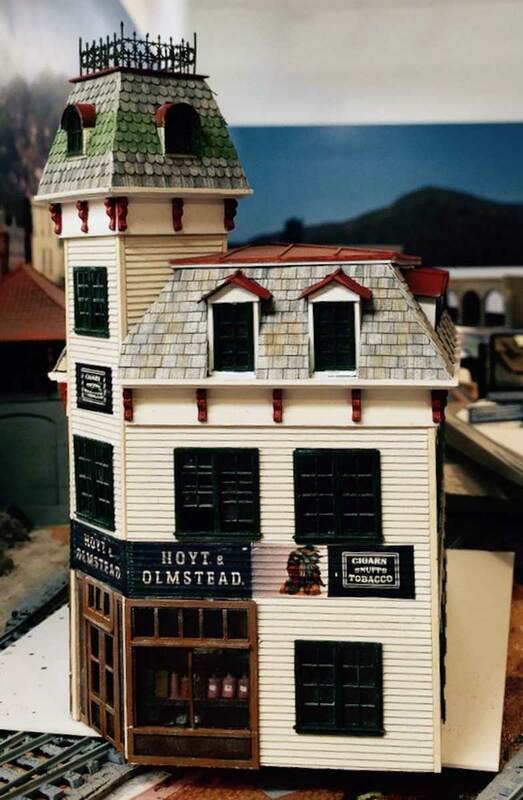 The HO scale cigar factory seen above is more than just wood shapes, plastic castings, paint, decals, and other parts. It is the sum of work done with an assortment of common and uncommon tools. Let’s take a look at some of the uncommon tools from my workbench that helps me move projects forward. One of the best all-around surfaces for model assembly is a piece of plate glass. Put masking tape around the edges to protect your fingers, and to keep the glass slightly above the underlying table. Glass is perfectly flat, impervious to paints and glues, and cleans very easily. 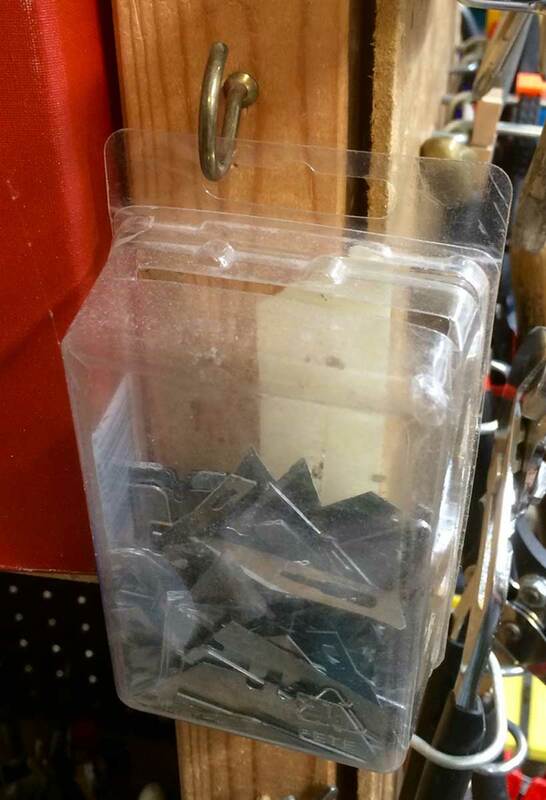 To clean the glass (or other work surfaces), get a single edged razor blade holder. You can scrape off glue or paint from the glass by holding the razor blade at a small angle to the surface of the glass. This is a good use for a razor blade that you’ve used a bit, before it goes into your sharps disposal bin. A small strip of Formica(tm), or similar, countertop laminate makes a great cutting surface. I also often use mine as a paint surface. I have a strip of laminate about 20 inches long by 4 inches wide where I do a lot of cutting and shaping. Note the photo above where the plate glass assembly surface sits behind the laminate strip. I can cut a piece on the laminate and then glue it on the glass. A sharps disposal bin is something that should be on or near your workbench. This one is made from a container that held screw hooks. I cut a slot in the top and hang it right next to my workbench. When the container is full, just tape over the slot in the top and toss it in the trash. Paint stirring paddles can be made into sanding sticks. Pressure-sensitive sandpaper can be folded over the edges and trimmed away. I use 80 and 220 grit sandpapers. I use these like files to square up corners, remove casting nubs, etc. The sandpaper can be cleaned with a brass brush when it gets loaded up (particularly true with plaster) and just replace the sandpaper when it gets worn out. Pressure-sensitive 2-inch sandpaper rolls aren’t cheap, but I find these to be so handy they’re worth their weight in gold. I’ve drilled a hole in the top of each paddle, and they hang off of my work table where they’re easy to reach. Tape is always handy. 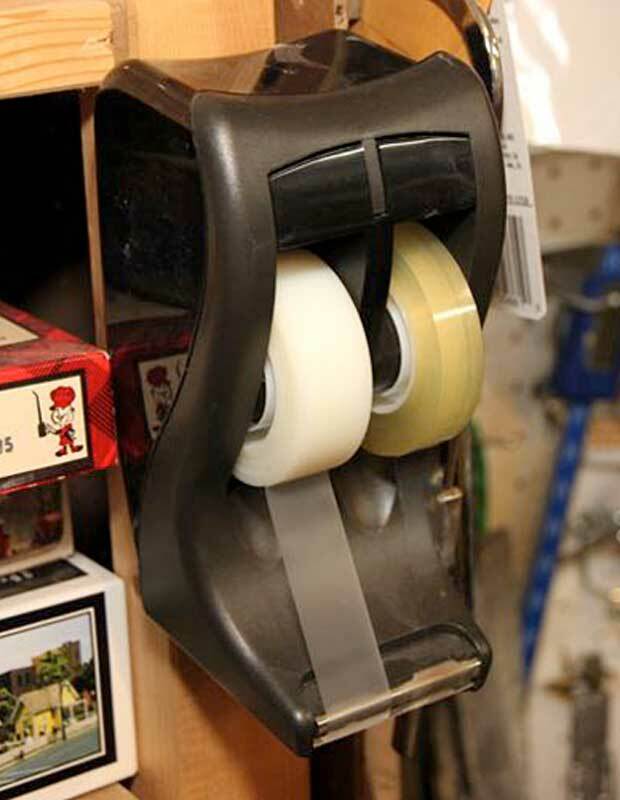 Some dispensers can be mounted to the workbench leg and some have room for two types of tape. You can see the version I prefer and those are single and double sided tape rolls ready to use. 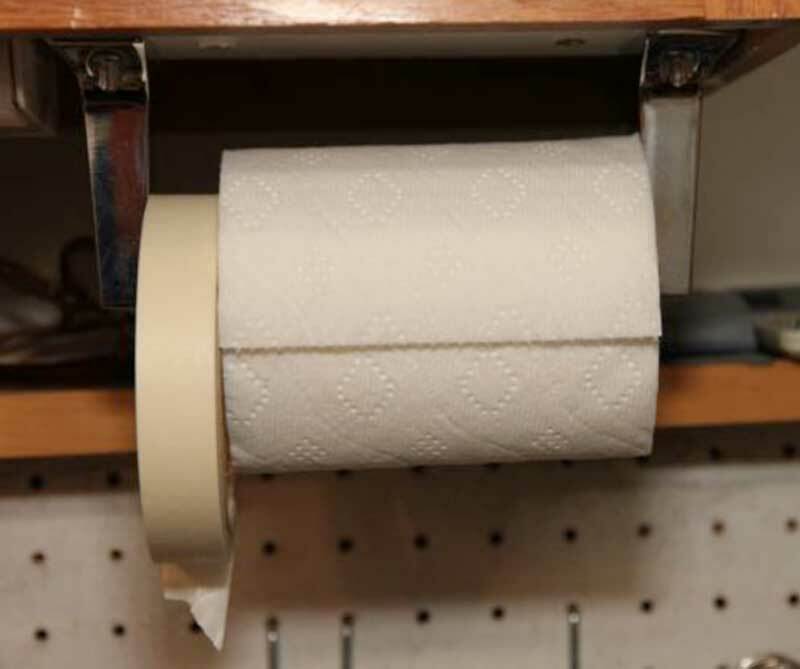 Along with tape, toilet paper can be handy at the workbench to clean up spills, soak up excess ACC, etc. Rolls are cheaper than a box of tissues and the hanger keeps it off the table top. The roll of masking tape fits great here, too! 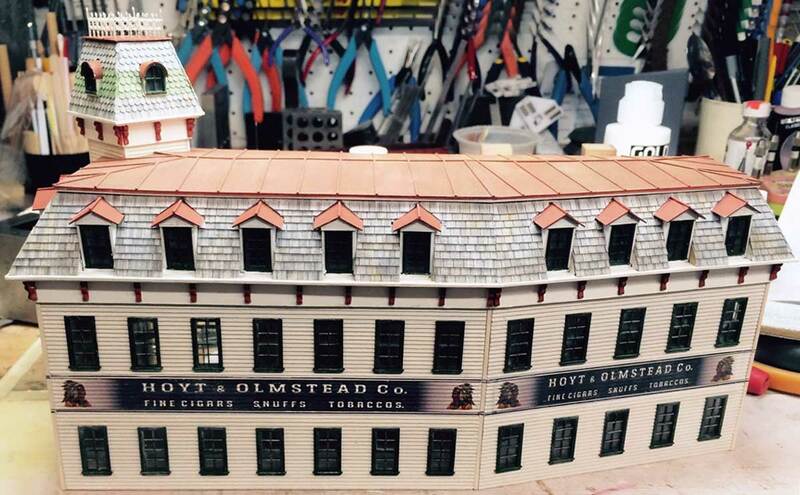 Let’s look at the cigar factory model again and review the tools that were used. The paint paddle sanding sticks were used to make sure the sides, tops, and bottoms of the walls were square, and were particularly useful for sanding the angles on the tower walls. The walls were assembled on the glass working surface. Double-stick tape was used to position the roof panels prior to assembly. A white strip was painted on the walls before the decals (with masking tape used to keep the paint in place), so the “white” here is actually the paint underneath showing through the clear parts of the decals. Both wood and CA glues were used for assembly, and glue drops were cleaned up with pieces of toilet paper. And a scratchbuilding project this big goes through a bunch of X-Acto blades, which were safely disposed of in the sharps container instead of tossed into the trashcan. Each of these tools, and many more, helped to produce the final model. There you have a few ideas for your workbench. We hope these are new to you and help keep your projects moving forward. Thanks to Dave Emery for this submission. This was just a portion of the details Dave sent along so we will feature more down the line. Thanks for stopping by for another blog post. Feel free to leave a comment in the section below. Please follow the instructions so your comment can be posted. All comments are reviewed and approved before they appear. Thanks for that reminder about plate glass. I had a piece years ago but now realize it has somehow disappeared in the course of the 7 moves we’ve made since then. Great tips up there – terrific stuff! Thanks for sharing! As for me, instead of plate glass, I use a thin 1/2″ thick slab of black 16″ x 16″ polished granite. The slab works just as well, and is a bit heavy so it doesn’t slide around any on my tabletop. The granite is also extremely resistant to solvents and paint. Easy cleanup with a dull X-acto blade. The piece of plate glass I use came from a discarded microwave some years ago. It is about 14″ square, has 4 legs/nubs on the bottom to raise it above my work surface and a raised edge on all four sides of the top. The sharps box is an excellent idea. I need one. Wow! I like the toilet paper holder and tape dispenser. I wonder if they make one for larger diameter rolls. It’d be handy, instead of having them lay around the workbench, taking up valuable space on the bench itself (or worse still, on the layout! 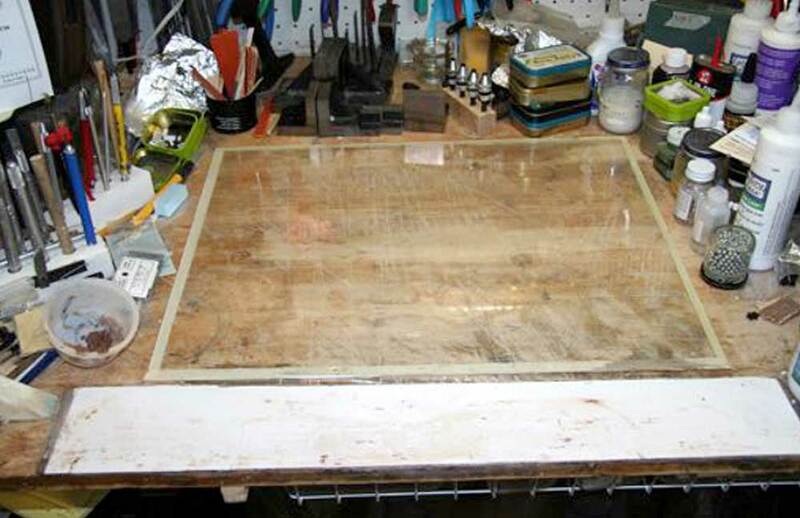 *Shudder*) Thanks for this timely tip – time to get the workbench cleaned and organized! I have found another advantage to using a piece of glass. You can put notes – kit instructions etc. under the glass. It stays clean and very handy to refer to during assembly. The sharps box and toilet paper/masking tape dispenser are great ideas. I really enjoyed Dave’s workshop clinic at the MARPM this year! He touched on all the items in this excerpt plus more. What was really great was to see and touch some of the tools in person. He does an excellent “show-n-tell”.